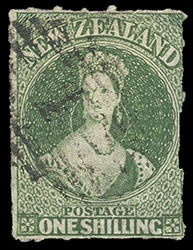 1862-63 Chalon Issue on Pelure Paper, Rouletted 7 at Auckland, Unwmkd. 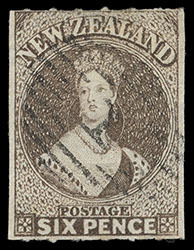 New Zealand, 1862 Queen Victoria "Chalon Head", 6d black brown on pelure paper, rouletted 7, unwatermarked, large margins showing portion of stamp below, rouletting on all sides, strong color and clear impression, cancelled by neat numeral "1" barred oval of Auckland, Very Fine and choice; with 1948 R.P.S.L. and 1991 P.F. certificates. Scott No. 24b. Campbell Paterson No. A5d (W). SG No. 88 £475 ($620). 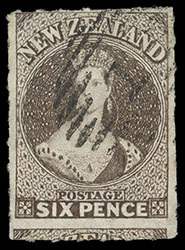 New Zealand, 1862 Queen Victoria "Chalon Head", 6d black brown on pelure paper, rouletted 7, unwatermarked, well centered with wide margins, roulettes showing at top and bottom only, fresh color, cancelled by neat numeral "1" barred oval of Auckland, choice and Very Fine, Antipodes, Corinphila, September 1988, lot 3470; with 1988 Holcombe opinion and 1991 P.F. certificate. Scott No. 24b. Campbell Paterson No. A5d (W). New Zealand, 1862 Queen Victoria "Chalon Head", 6d black brown on pelure paper, rouletted 7, unwatermarked, clear to large margins, touched at bottom, beautiful deep rich color, lightly tied by numeral "1" barred oval, matching "Auckland, New Zealand, MY 7, 1863" origin backstamp on blue cover to London, England, endorsed "Via Southampton" at top left, London (7.21) arrival backstamp, Very Fine, Antipodes, Corinphila, September 1988, lot 3471; with 1988 Holcombe certificate. Scott No. 24b. Campbell Paterson No. A5d (W). SG No. 88 Estimate $1,000 - 1,500. 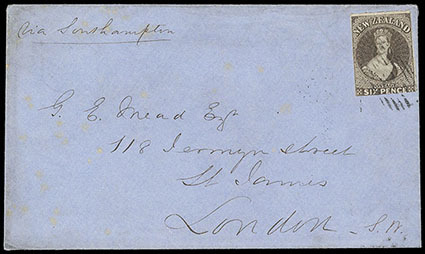 A RARE USE OF THE 1862 6D BLACK BROWN ON PELURE PAPER ROULETTED 7 ISSUE ON COVER. 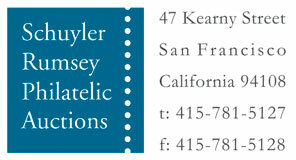 The 6d postage prepaid a ½ oz. letter to the United Kingdom via Suez and Southampton. 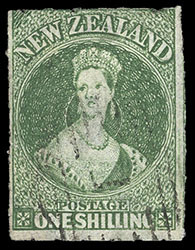 New Zealand, 1862 Queen Victoria "Chalon Head", 1s deep green on pelure paper, rouletted 7, unwatermarked, roulettes showing on all sides but some recut, strong color, cancelled by numeral "1" of Auckland barred oval, scarce and Very Fine; with 1978 R.P.S.L. certificate. Scott No. 25c. Campbell Paterson No. A6f (Z). New Zealand, 1862 Queen Victoria "Chalon Head", 1s deep green on pelure paper, rouletted 7, Re-entry (R. 1/5), unwatermarked, showing roulettes on all sides, strong bright color, light barred oval cancel, F.-V.F. and scarce re-entry variety. Scott No. 25c var. Campbell Paterson No. A6f (Z) var. SG No. 89 var. £1,800 as normal ($2,360).